The winners of the 12th edition of the Whaka100. 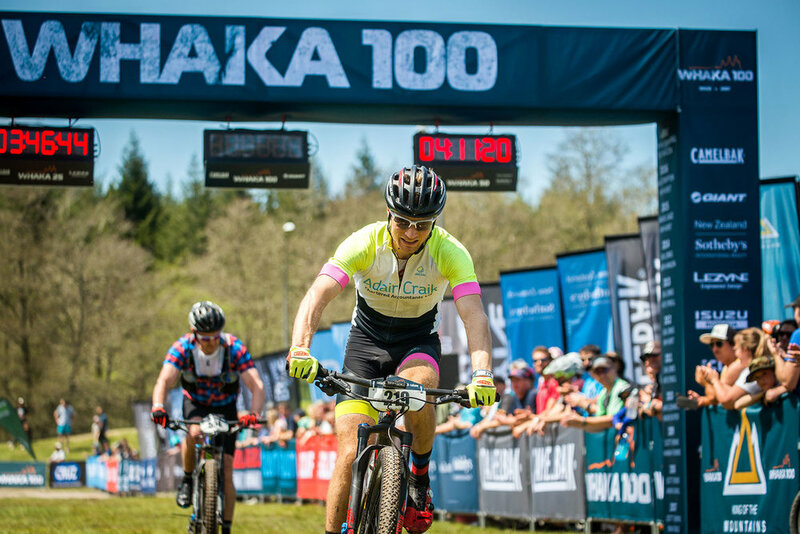 Course records have been broken as top mountain bikers took on the Whaka100 Mountain Bike Marathon presented by CamelBak at the Whakarewarewa forest in Rotorua today. Christchurch's Tim Rush won with a time of 05:10:56 and Manawatu’s Josie Wilcox won with a time of 05:53:32, both breaking the 100km records. Tim Rush beat the course record by 11 minutes, while Josie Wilcox beat it by 19 minutes. Rush said he felt amazing at the start. He said he ran out of water at the 70km mark but managed to stay ahead. Brad Jones came in second with a time of 05:17:02 and Sam Shaw came third with a time of 05:25:19. Jones said he hadn't ridden the Whaka100 in a few years but it was just as hard as he remembered it. Wilcox was happy to come away with the win after being ahead throughout the race. Wilcox said she did a lot of training in preparation with a lot of back to back climbing and long days on the bike. Tanya Sharp came second with a time of 06:56:57, and Imi Blance came in third with a time of 07:05:04. Event director Tim Farmer said he was happy with how the day went with spectators out enjoying the weather and festival feel. The 100km endurance race on the world-class mountain bike trail network in the Whakarewarewa Forest is known as the toughest mountain bike marathon in the southern hemisphere. Christchurch's Tim Rush and Manawatu’s Josie Wilcox win this year’s Whaka 100 both breaking the 100km records. I want to go to Rotorua now!